LSP Industries, Inc. has introduced the MinaMizer spray unit, developed to enhance its LVLP (low-volume, low-pressure) spray technology to dispense fluids in a consistent, continuous and controlled manner. MinaMizer systems reduce costs, say company officials, by reducing the volume of the fluids used, directing them into the area needed, and minimizing cleanup of the stamped parts and the press. 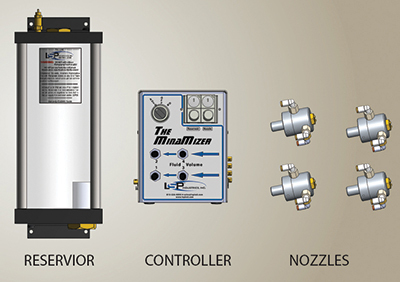 All MinaMizer systems incorporate precision valves and regulators to ensure consistency and independent volume control to each nozzle. Standard systems are available to manage two to six nozzles. See also: LSP Industries Inc.